Let’s admit the truth, shall we. Even the best of us command line gurus (and only few of us are really gurus) prefer the simplicity and ease of a GUI frontend to our favorite command line tools. Zenmap is a neat GUI tool for the nmap command line scanning utility found in the Kali Linux penetration test distribution. For sure, nmap is a great scanning tool but newbies may find it intimidating considering the hundreds of options the command line utility has. That’s where Zenmap comes in. For newcomers to nmap who can’t be bothered to learn the command line syntax or beginners struggling with the nmap syntax, Zenmap is like unexpectedly finding a pot of gold. As far as I can tell, Zenmap comes along with nmap in Kali Linux. 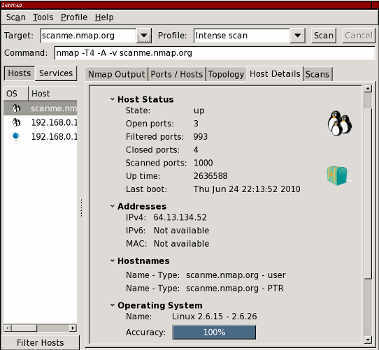 But when I installed nmap on an Ubunutu/LinuxMint desktop and later on a CentOS 7 system, I noticed that Zenmap did not accompany nmap in both instances. I had to do a separate install on the LinuxMint system. I was surprised to not find Zenmap in the base CentOS repositories (but nmap is there). The great beauty of Zenmap is that it lets you hit the ground running. All it takes is a few seconds to get the program up, pick your options and get going. Type zenmap on the command line and the GUI frontend opens up. Enter the host name (a domain or IP address) you wish to scan and in the drop-down box to the right, select the type of scan you want to run. That’s all you need to do to scan for vulnerabilities on a host. A huge plus is that the tool displays the command line syntax for the profile you pick. I consider it a nice way to let beginners pick up the command line syntax for nmap. There are scans of various degrees of complexity and duration that you can run on Zenmap. You can pick from ping, quick scan, ping scan, intense scan, quick scan plus, slow comprehensive scan and more types. An intense scan, all tcp ports of a small web site can take about 30 minutes while a quick scan I did a short while ago took just 5.66 seconds. The quick scan tells you open and filtered ports, whether the site is up, number of ports scanned and number of closed ports. Zenmap lets you save the scan results and compare them, create new profiles for repeated use and so much more. The version of Zenmap on Kali Linux is 6.4.7 but the version on the Ubuntu repositories is older (6.40.0). Zenmap works on multiple platforms including Linux, Windows, Mac OS X and BSD. In this post, I have only skimmed the surface of the vast Zenmap/nmap iceberg. To get a better idea of its capabilities, why don’t you take Zenmap for a spin. But first make sure you have the Kali Linux distribution. You can download Kali Linux here. Note: As with any penetration testing tool, always ensure you have permission from the host owners before running Zenmap and nmap or do it on your own web site.